CROSBY  Latest word on the widening of FM 2100 from FM 1960 to South Diamondhead Boulevard is that the plans are still to divide the highway and currently, there is no funding for this project. As survey work was being done on FM 2100 excitement was building among the community concerning the beginning of the purchase of 107 acres of right of way. 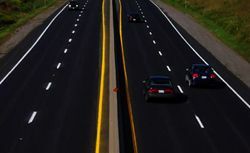 The impact of the proposed divided highway is generally upon six residences, eight commercial structures, and two churches would be potentially displaced as a result of the proposed project. Last May at the public hearing, construction was anticipated to begin in 2017. The estimated cost was $80, 000, 000 and the estimated duration of construction was to be three and a half years.